The P-8A Poseidon jet, a replacement maritime patrol aircraft for the P-3C Orion, made its Rim of the Pacific (RIMPAC) exercise debut this year, flown by two air crews from Air Test and Evaluation Squadron (VX) 1 at Marine Corps Base Hawaii in Kaneohe Bay, during the 23rd edition of the biennial exercise. "While the P-3C Orion is a very forgiving aircraft and has served the fleet very well, the P-8A Poseidon is easier to fly, trims well, and handles flawlessly [at low altitude]," said Lt. Cmdr. Chris Artis, VX-1 maintenance officer and integrated training team pilot. "It's easy to maneuver, and the situational awareness in the cockpit is unlike anything I've ever seen before. Getting used to the technology and the different displays can be a challenge, but overall it's fun to fly." The VX-1 crews flew two P-8As during 24 exercise events ranging from routine test flights to simulated anti-submarine warfare. VX-1 officials said training requirements are extensive in the P-8A because of the complexity and the speed of the aircraft, and that RIMPAC provided extensive, open airspace and a robust exercise schedule where the squadron could demonstrate the capability of the new aircraft. "The addition of two P-8A aircraft from Test and Evaluation Squadron 1 enabled us to get an early look at how we can integrate this new platform in a Joint and Combined operating environment," said Adm. Cecil D. Haney, U.S. Pacific Fleet commander, who flew a mission with VX-1 earlier in the week. "I had the opportunity to personally observe its great potential during a flight where the crew demonstrated each weapon system while we conducted ASW and ISR." The P-8A is based on the Boeing 737-800ERX airliner, but incorporates a host of modifications. 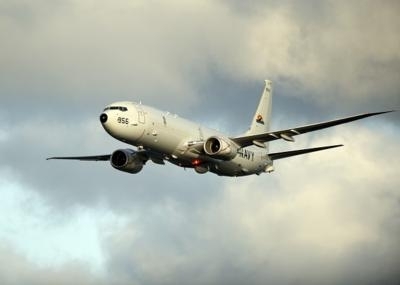 The Poseidon will replace the P-3C Orion, now in its 50th year of service, as a long-range anti-submarine warfare, anti-surface warfare, intelligence, surveillance and reconnaissance aircraft. It will maximize the experience and technology of the Orion but with significant growth potential, greater payload capacity, advanced mission systems, software and communications. 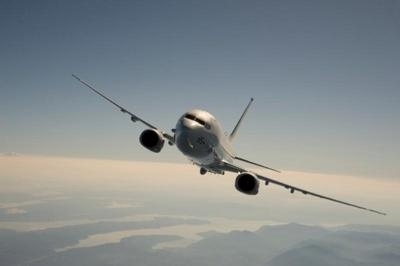 Six additional fuel tanks in P-8As allow for the jet's extended range. "The P-3C is an aging airframe with aging systems on board." said Cmdr. Gregory Sleppy, VX-1 operational test director for the P-8. "It's becoming very expensive to operate because of the age of the airframe, and has been up for 50 years; that's half the life of [naval] aviation." P-8As feature Raytheon multi-mission surface search radars, and incorporate a short bomb bay aft of the wings for torpedoes, sonobouys (small expendable sonar capsules that are dropped or ejected from the aircraft for anti-submarine warfare or underwater acoustic research), and cargo. "We can look forward to an increased availability rate right off the bat," said Sleppy. "Next you're going to see a more interoperable platform. The communications suite on the aircraft is far more advanced. Those are going to be the immediate things that the fleet commanders are going to see." Twenty-two nations, more than 40 ships and submarines, over 200 aircraft and 25,000 personnel are participating in the RIMPAC exercise from June 29 to Aug. 3 in and around the Hawaiian Islands. The world's largest international maritime exercise, RIMPAC provides a unique training opportunity that helps participants foster and sustain the cooperative relationships that are critical to ensuring the safety of sea lanes and security on the world's oceans. RIMPAC 2012 is the 23rd exercise in the series that began in 1971.